After I left Corporate America in my early 20's to pursue entrepreneurship, I accumulated about $95,000 of debt. My credit card debt was depressing. But there was always that subconscious nagging feeling that something wasn't right. I was ignoring the reality of my finances. Instead of facing reality and changing my situation, all I wanted to do was hide from it. I decided that I was going to take charge of my financial future, which meant getting out of debt, creating multiple income streams, and building wealth. Within the span of about 18 months, I built a seven-figure business, started to destroy my debt, and got out from under the depression of hiding from reality. 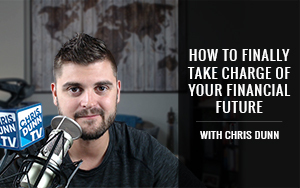 In this episode, I'm going to show you how you CAN take charge of your financial future. But only if you are willing to do what it takes. Nothing will change until you decide things MUST change. Most people are unable to take charge of their finances not because they can’t but because they won’t. Things may not be bad enough yet so they are not willing to do what is necessary. Don’t wait until it gets to that point! Face up to your fears and own up to the consequences of not being in control of your finances. Find the motivation inside of you that will make you take action! Find the motivation inside of you that will get you to take action! Before you take action, you need to know what kind of financial future you want to have. Do you want to have a lifestyle of the rich and famous, jet-setting all over the world to fancy places? Or do you want to be able to live a simple life in comfort without debt and money worries? Or perhaps it’s passive income that you desire? Whatever it is, you need to make a choice and be clear on what it is you want. Different destinations will require different decisions and strategies. Once you have decided what kind of financial future it is that you want, it’s time to face up to the truth of your current financial situation. What debts do you have? How much are you earning and what do you have leftover (if any) every month? Do you have any savings, investments or assets someplace else? What percentage of your paycheck are you spending on things that don’t matter? For things to change, you need to see reality as it truly is. There is no way that you can have a bright financial future if you are laden with bad debts. Your first move in building the kind of financial future that you want is to get rid of any bad debts that you have. Bad debts are loans that are used to buy things that not only cost you money over the long term but also decrease in value over time. Typical examples of bad debt are credit card debts used for shopping and travel and car loan payments. Although these things are fun to have, they do nothing for your financial future. Pew Charitable Trusts report that 39% of Americans have unpaid credit card balances. Make it a priority to pay off your credit card debts as soon as possible. If you can’t seem to control your credit card debt usage, destroy those cards to avoid the temptation of overspending. Whatever you do, make an effort to eliminate debt fast. In episode 008 of Pathways To Wealth, we talked about 3 Ways To Eliminate Debt Fast. Managing debt is an essential step to taking control of your financial future. After dealing with your debts, make sure that you create a budget and track your spending. You will gain a huge sense of financial control when you can live within your means. There are many easy ways to create a budget including using free online software like Mint, consumer.gov’s website or just use your basic Microsoft Excel spreadsheet. There are some other useful household budget spreadsheets that you can use as well. Most people don’t realize this, but everyone has something that they can use to help them improve their finances. Most of us have a 401k savings, maybe some savings stashed away, some specialized knowledge or skills or at the very least, the ability to learn and the willingness to try. Take inventory of all tangible assets like cash, retirement funds, gold, cars, electronic equipment, credit score. Then take inventory of all intangible assets like ability to speak English, math skills, people skills, and any other talents. There are stories of people coming to America with nothing but a few dollars in their pockets, then turning that into a fortune. Many of these people couldn't speak English and had no connections when they arrived. If they can do it, you're at an even better advantage! Once you have identified what resources you have available to you, it’s time to educate yourself on the different types of strategies to create income and wealth. There are a myriad of strategies that can help you to take charge of your financial future including real estate investment, stock trading strategies, buying a franchise, opening your own brick and mortar store and creating an online business. In episode 002, we talked about the Two Best Pathways To Create Income. Every strategy has its pros and cons and may suit one person but not another. You need to decide which one you feel most comfortable with and preferably have passion for. Educate yourself as much as you can, read all the books that you can find and attend as many meeting and events around your chosen strategy. Next, set goals to keep you motivated and moving forward. (T)imeline- include a deadline for your goals. Your financial journey will be a lot less risky and stand a higher chance of success if you can find an experienced mentor to guide you. Some mentors will be happy to spend some time with you for free, but some other mentors may require a formal paid arrangement. Whoever it is that you find, make sure that you use someone who has achieved what you want to achieve. While it is great to be investing into strategies that will help you take charge of your financial future, you also need to be prepared for the downsides. One simple way to do this is to create an emergency fund. The purpose of an emergency fund is to create a financial buffer to reduce the stress of any unforeseen expenses and changes. It will help you sleep better at night and will also help you feel more confident as you get involved in different financial investments. 911 Emergency Fund – I think everyone should have a MINIMUM of $2,000 – $5,000 they can access immediately via debit card, ATM, or checks for emergencies. This is for things like emergency medical, blown out tire, food, or rent/mortgage payment. Safety Buffer Fund – Once someone has funded their 911 emergency checking account, they can work towards having a minimum of 6-12 months living expenses in a liquid bank account. This is great to have in case you get laid off or encounter a major expense. It’s important to regularly review your progress. Not only will it help you get back on track in case you have got distracted and veered off course, but it also helps you to acknowledge how far you have come. I like to do bi-weekly and monthly income and expense statement reviews. This keeps me on track with what money is coming in, and where it's flowing out. Finally, it always is a good idea to be grateful for all that you already have and have achieved. I have found that living with an attitude of gratitude tends to attract more things to be grateful for into your life. I would suggest that you also make it a habit to give back a portion of your income and wealth. It helps keep you grounded and takes the focus off your needs for a brief period, which can be great for improving self-esteem. At the very least, you can share how you finally managed to take charge of your financial future!